Nothing beats a good beverage. The only way to make it better, be it hot or cold, is to enjoy it from an equally beloved vessel. 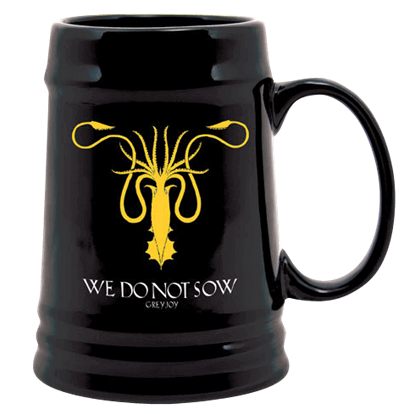 And if you love A Game of Thrones and a Song of Ice and Fire, no cup, mug, or stein will compare to one of our Game of Thrones mugs and glassware - especially not when it shows off your favorite House sigil! Each and every one of our pieces of glassware are fully functional and safe to use, so they are not solely display pieces. 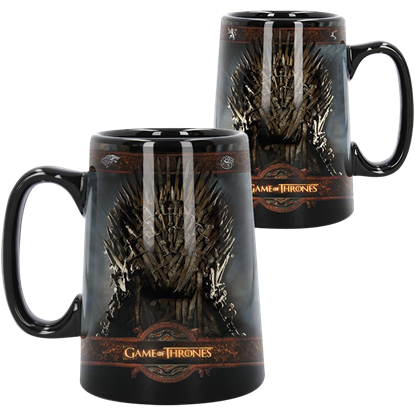 Our Game of Thrones mugs and steins can be filled with hot tea or cold cider, with coffee or spirits or water - whatever your pleasure, they make for fine drinking vessels. The same is true of the pint glasses and shot glasses we offer. 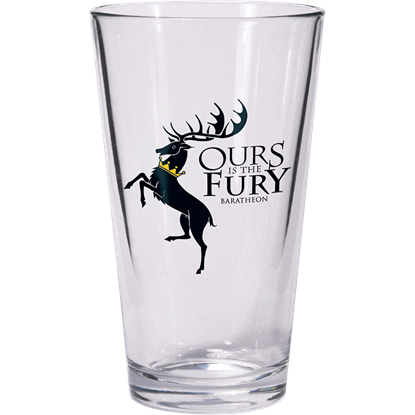 And for those who want to show their allegiances when they drink, our collection of glasses, mugs, steins and drinkware includes those emblazoned with the Stark direwolf, the Lannister lion, the Baratheon Stag, the Targaryen dragon, and various other symbols of noble houses and noteworthy lords, ladies, and knights. So for a great collectible and an equally great drinking vessel, nothing beats our selection of fine Game of Thrones mugs and glassware. 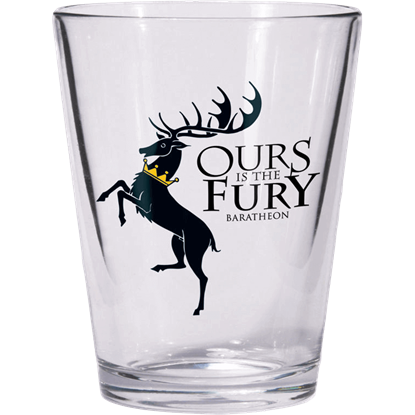 Take a quick shot before you step into battle with the Game of Thrones Baratheon Shot Glass. This officially licensed glassware based on the book series and HBO TV show can be an elegant addition to your Game of Thrones collection. 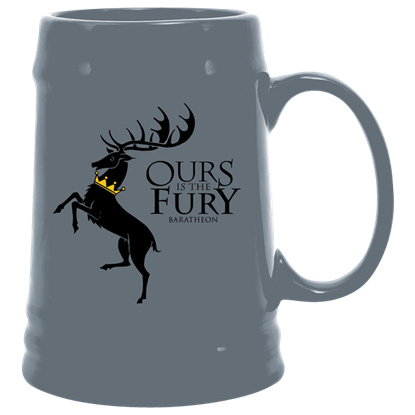 With this new Game of Thrones Baratheon Sigil Ceramic Stein, you can not only add a piece of Westeros to your home and celebrate your love of the series, but you can also enjoy a beverage from a cup bearing your favorite house sigil! Firewater anyone? Fans of the George R.R. Martin series, A Song of Ice and Fire, know that the three dragon children of Daenerys Targaryen pack some heat. 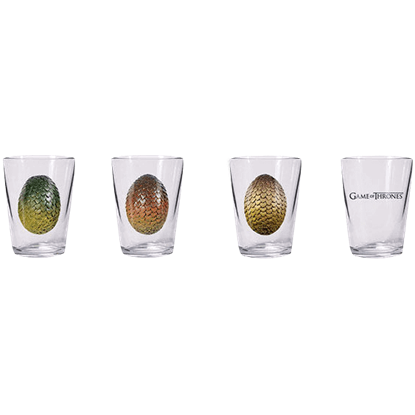 Now you may do the same with the Game of Thrones Dragon Egg Shot Glass Set. Medieval Collectibles is proud to announce a new line of licensed products based on HBOs award winning television series Game of Thrones. 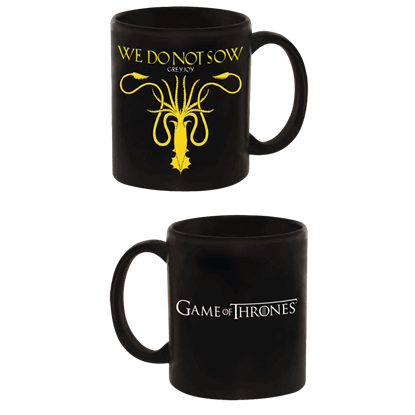 Now you can bring a piece of Westeros into your home with our Game of Thrones Greyjoy Mug. With this Game of Thrones Greyjoy Sigil Ceramic Stein, you can add a piece of Westeros to your own home and celebrate your love of the Game of Thrones. 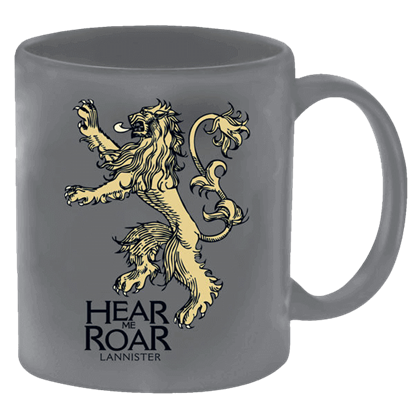 You can also enjoy a beverage from a cup bearing your favorite house sigil! Sometimes, there is no better way to then to kick back and enjoy a nice pint. 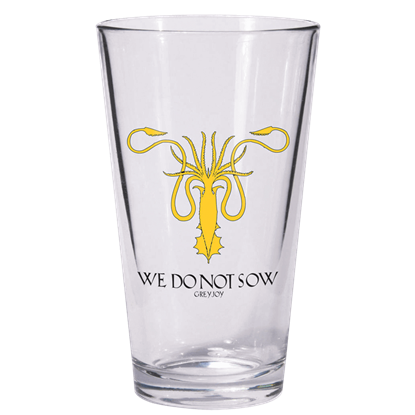 Of course, that pint can not only taste great, but look great too, when you enjoy it out of a new Game of Thrones Greyjoy Sigil Pint Glass! Shot glasses are not just great for enjoying a sip of something strong. 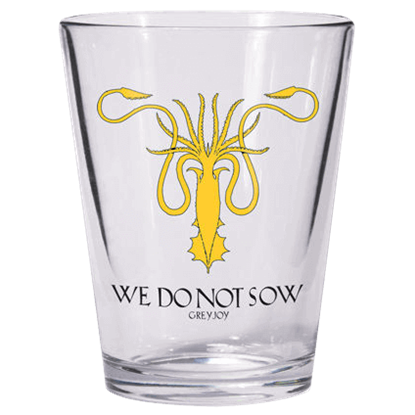 They are also a great collectible, and this Game of Thrones Greyjoy Sigil Shot Glass is a way to show your love of this phenomenal series and House Greyjoy! 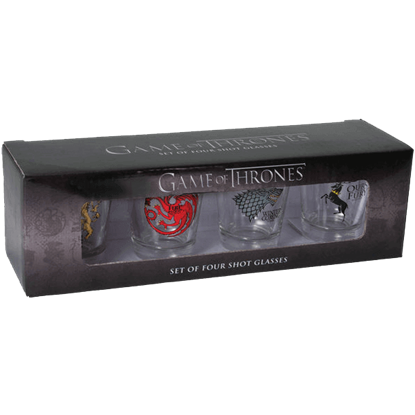 Fans of a Game of Thrones no doubt have collections already going, but this Game of Thrones House Sigil Shot Glass Set is a collection in itself, offering four fine shot glasses that will suit any fans love of Westeros and its great names. Would you take a seat on the Iron Throne? The Game of Thrones Iron Throne Tankard is an officially licensed, food safe collectible ceramic cup featuring a photo-like image of the Westerosi throne made of swords on both of its sides. Medieval Collectibles is proud to announce a new line of licensed products based on HBOs award winning television series Game of Thrones. Now you can bring a piece of Westeros into your home with our Game of Thrones Lannister Mug. 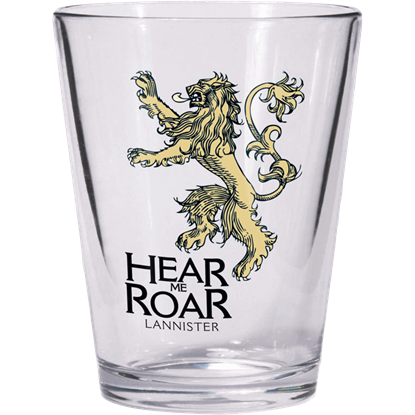 Bow your head in silence and take a moment to show honor to those lost in battle with the Game of Thrones Lannister Shot Glass. Straight from one of the oldest dynasties this licensed glassware is sure to complete your shot glass set.